NAMSAR is a young band from the fertile Sabah Metal scene, one quick look at the band picture says it all. This 4-tracker of a cd is a raw thrash affair, with some flair of death Metal tinged in. Synonymous with the band's age, their thrash Metal can't escape the naiveity nevertheless, but at least I can see the potential within "Demon". They have so many years ahead for the Metallic quest, and as age and experience gone by, they can expect nothing but improvements. NAMSAR did surprise me with some parts of their composition, there really is some good structures here. They just need a little more 'horning' up to make them flourish to something even better. 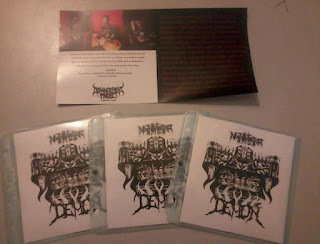 With guidance from countless esteemed Metal bands there, I'm sure NAMSAR could do no wrong. There's definitely an advantage to be in one of the most active local Metal scene at the moment. For NAMSAR, just keep it up.